Facebook recently launched a new pilot program called “Instant Articles” that allows select publishers to upload articles directly to the NewsFeed. LinkedIn has already built a publishing empire by allowing users to do something very similar, and sites like Medium and (to a lesser extent) Google+ are centered around exactly this kind of self-publishing. This leaves dedicated company blogs in a strange place. They are still necessary to act as a hub for all of your content and as a dedicated place where you control the design and benefit from the close association between your brand and the material you produce. However, the attention of many consumers is shifting more towards platforms that consolidate all the content that interests them into one destination as opposed to visiting a few different blogs. “In the perfect world, I recommend covering all of your bases with your own blog as a primary hub, Medium for sharing thought leadership and LinkedIn for added exposure,” said Sujan Patel, the VP of Marketing at When I Work and creator of ContentMarketer.io. This article will discuss how to utilize the opportunities for growing and scaling your audience on these alternative blogging platforms while still maintaining a robust and healthy central blog of your own. I’ll explore how to port existing content from your blog and tailor it to each platform in order to maximize your content’s impact. It used to be that most content lived on a single site that the publisher owned. People used to find blog content by visiting a company’s website directly, using an RSS reader, through email or the search engines. 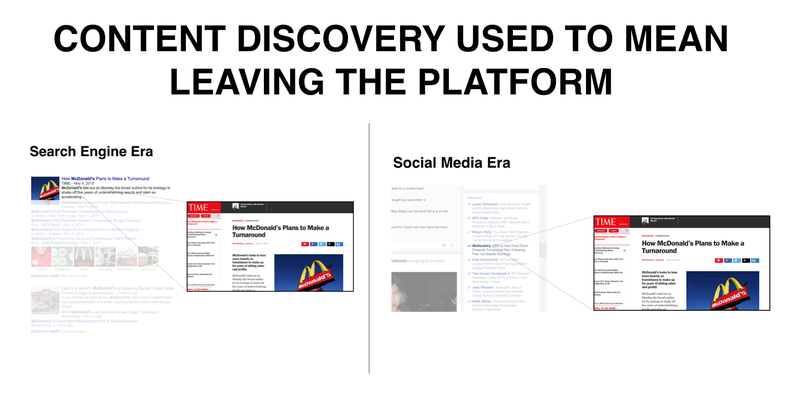 Then came social media and changed how users discovered content completely. Now people could find great new content to explore via recommendations from friends or from the crowd, but in many cases they were still leaving the social platform and going to the original publisher’s site to actually consume this content. What has started to happen though is that the level of attention that social platforms command has reached a critical mass and this has caused the center of gravity to shift. For a growing number of publishers increasingly reliant on social referrals for traffic, it has begun to make more and more sense to just host the content on the platform itself. Currently, publishers write a synopsis and a link pointing back to their own site that they then post to Facebook, Twitter, LinkedIn, etc. They go through all this effort in the hopes that the user will click through to their content outside the platform. This type of referral constitutes as much as half of the visitors to some publisher’s content. Wouldn’t the content being promoted this way get even more views and be consumed by more people if the friction of clicking through could be circumvented? Why not just put the content directly on the platform and get the increased exposure? The reason that sites like the New York Times or ESPN might be hesitant to put their content on another platform is fairly obvious. They rely on ad-revenue generated from their own sites to sustain their business, so the only way they’ll ever agree to such an arrangement is if the advertising short-fall is compensated (which instant-articles from FB is attempting to figure out by splitting ad revenue with the original publisher). However, for brands who are not dedicated publishers but rather use content for marketing, they don’t have this problem because the content is the advertisement. The entire end-game of content marketing is to have your quality content exposed to as many people (of the right audience) as possible and then benefit from the goodwill that generates. As long as your name is attached to the content in some form or another, where your content is published matters less than the fact that more people might see it. However, it’s still important to have a home-base for your content, because the content that you own will be most effective when you control the exact way and context it is presented in. Not to mention, your organization reaps the full SEO benefits of your content on your own website, readers will be engaging on your owned properties as close as they can be to your service offerings and more. 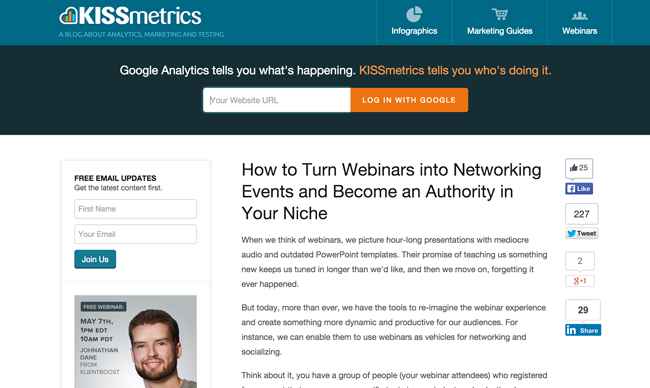 KISSmetrics would not be able to do the up-selling it does if it didn’t have control over the context of their content. When your content is published on other platforms it may help get your name out there, but it will be much harder to convert customers or get them to further explore your brand. The friction that would keep them from clicking through to your website in the first place is actually increased once they are already able to consume your content without leaving. It’s a lot easier to convert leads if you can get them to read on the same website they will ultimately convert on. With that being said, the increased exposure that comes from republishing content on another platform is often well worth any slight cannibalization of attention or leads you might experience. Also, LinkedIn, Medium or another platform you’re contributing to isn’t under your full control and could potentially shut down because they get acquired, go bankrupt etc. There has always been platforms, especially in social media, that have risen to fame and mainstream use and eventually failed. Keep in mind the associated risks before investing too much time in any one channel. 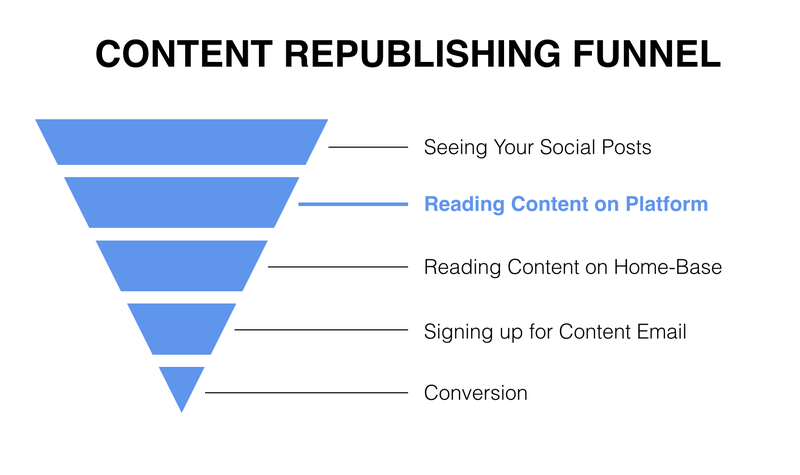 To better frame the use of republished content, think of readership of this content as an extra stage of the funnel that widens your reach substantially. Sure it’s another potential step for leakage, but the expansion of your coverage is almost always well worth it. The increased exposure that republishing allows might be hard to ignore, but reaping these benefits to their maximum potential will not be as easy as simply cutting and pasting your existing content onto a new platform. Each platform (whether it’s Facebook, Medium, LinkedIn or Google+) each has its own user expectations and unwritten rules that successful content will need to follow. Since your “owned” website will be acting as your content home-base you can use this outlet to create content in whatever form you deem appropriate, but when it comes to republishing your content you will need to tweak your core content for length, formatting or scope to fit with the norms of the various republishing platforms. It goes without saying that when it comes to choosing platforms to republish your content on, the key consideration should be whether the fit is right. Regardless of what channel your organization is republishing content on, ensure that a link to the original blog post is included at the top or bottom of the republished piece to properly attribute your owned content. For instance include a sentence like the following within your article: The piece originally appeared on the General Electric blog. LinkedIn is the platform that is the most on top of this trend today, having built a robust tool for publishing and already trained their users to expect and consume content directly from the social network. LinkedIn’s Pulse can have anyone featured and there has been considerable analysis done on what content does well and gets featured. Most of the top LinkedIn content tends to run on the briefer side (under 1000 words). This makes sense because many users on LinkedIn are professionals who tend to be busy and want to get directly to the point. This also makes it a good idea to break your article up into very brief digestible chunks. The more headlines and high-level organization the better. Inclusion of a few (three-five) pictures and article topic tags at the bottom of article has also been shown to increase its chance of being read, shared or featured by LinkedIn itself. 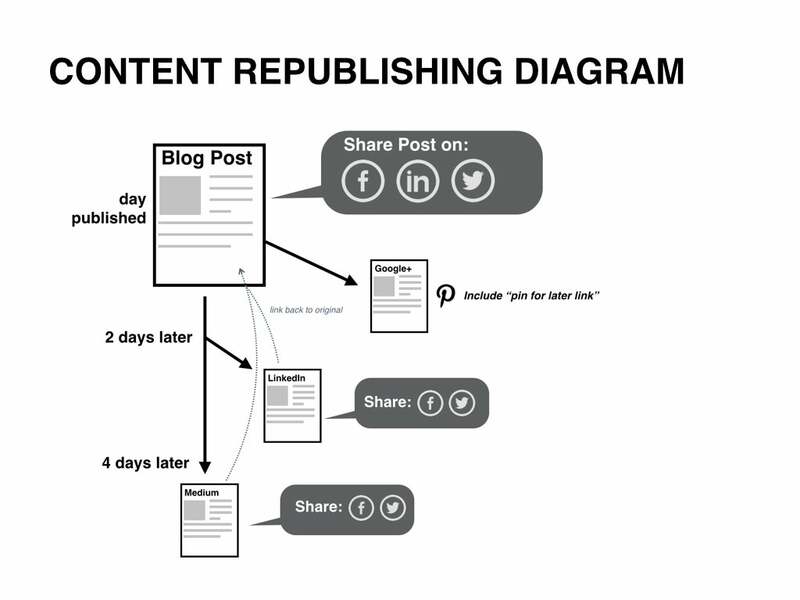 Google+ content tends not to be a direct republishing of content but more of a lengthy summary. Limited formatting and content embedding options lend themselves to providing a high level summary and an option to either share or read more. Another key feature to explore is the ability to use hashtags and to tag specific users within the content itself. This is specifically good for articles where you feature colleagues or invite audience participation, it also allows the articles to perform well for longer. 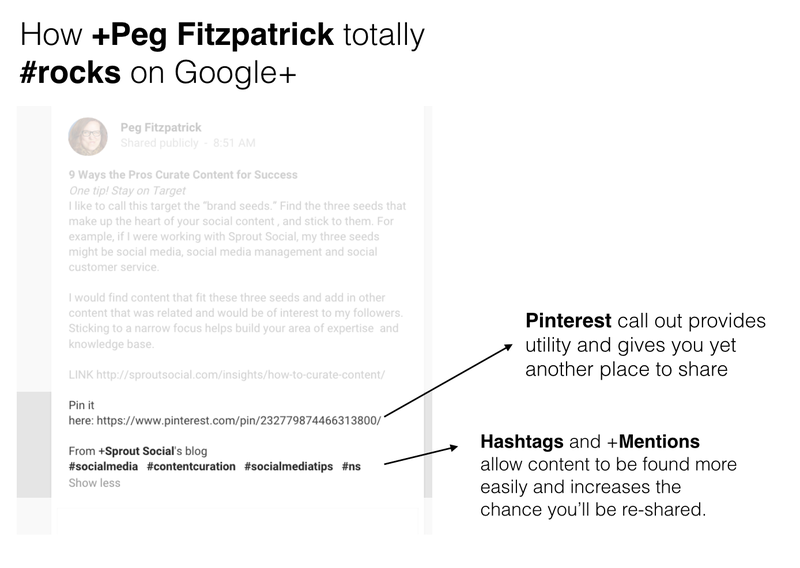 Social media guru Peg Fitzpatrick has pioneered a little trick that has become somewhat of a convention on Google+. Instead of just posting a link directly to the content, she also links to a Pinterest pin of the article to pin it for later reading. In addition, she makes great use of the mention and hashtagging features to further increase the utility, share-ability and stickiness of her concise article summaries regularly. Medium is different from the other platforms mentioned in that it is specifically dedicated to publishing blog style content. However, Medium is just as much geared towards discovery as it is towards publishing and the increased readership that comes with it. Content that does well on Medium tends to be on the longer side with 1000 words plus, it also tends to rely heavily on visuals. Medium gives creators the ability to display gorgeous imagery throughout an article and on the header of an article, which their user base has come to expect at this point. For examples of businesses both republishing and producing original content on Medium, look to CLICK. by Outbrain, the Crew Dispatch and Google Ventures. After considering the major reasons for maintaining a content home-base, the reason that republishing is still necessary, and the small details required to successfully republish, the final step is to see how all of this fits together when it comes to actually launching all your content out into the wild. The first thing to do is to create your initial content and launch it on your blog. Doing so requires all the regular due process of sharing updates to major platforms like Facebook, Twitter and LinkedIn the day the blog post is published and in the following days and weeks. To both mitigate the audience cannibalization mentioned earlier, to avoid inundating your fans with repeat content and to give the original blog post an opportunity to gain traction in the search engines and social media, hold off on republishing the original article elsewhere for at least a few days. Sharing an excerpt of the piece on Google+ can happen earlier since it isn’t likely the full version of the article that you’re republishing. Then, roughly two days after launching your post, consider republishing it on LinkedIn. This republished article will differ slightly and will probably reach a slightly different audience, so don’t be bashful about also sharing on Twitter, Facebook and LinkedIn. After about two more days repeat this process now with Medium as another republishing platform. Again, with any republished blog articles, make sure to link back to your original. If you play your cards right, you can use this guide for republishing to take one core piece of content and create a much bigger splash than you would if you just focused on blogging alone. This is the power of utilizing multiple blogging platforms.